Come enjoy outstanding live performances in our intimate venue! 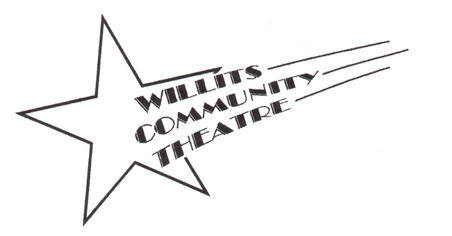 The sure-fire comedy “Legends!”, about two legendary aging actresses discovering a way to survive, will show at the Willits Community Theatre from April 18 to May 4. Written by James Kirkwood Jr, and directed by Bill Barksdale, the play centers on two one-time movie legends who are courted by a desperate young hot-shot producer to star in his Broadway show–“Star Wars: The Play”. The fact that the two aging actresses have hated each other ever since the Hollywood publicity machine fabricated their feud decades ago poses the central challenge for these two legends to work together. Playwright Kirkwood, a winner of the Tony Award and Pulitizer Prize for Drama, is most well-known for his famed hit, “A Chorus Line.” He wrote “Legends!” specifically for two of Broadway’s biggest stars, Mary Martin and Carol Channing. Starring in the show are Gretchen Anderson and Kathy deBane as the two living legends, with Christopher Martineau as the wheeler-dealer pushy young director, Mary Burns as a feisty maid, and Moises Torres and Anthony Sylstra in supporting roles. It’s half the fun when Martineau offers one thing to the women and then comes in with something else in their contract, and they are set on getting their revenge over him. “It’s a rollercoaster ride all the way,” says Barksdale. “Legends!” will open on Thursday, April 18 with a special benefit performance sponsored by Emandal Chorale. Benefit tickets are available in advance through Tamara Adams at 459-9252. Regular shows are on April 19, 20, 25, 26, 27, 28, and May 2, 3 and 4. Tickets for the regular Thursday and Sunday performances are $15 and for Friday and Saturday shows $20. The final Saturday matinee is $15. Advance tickets for all regular shows are available in person at Mazahar, 38 S. Main St., Willits; online at Brown Paper Tickets or by phone 24/7 at 1-800-838-3006. Tickets will also be available at the door until sold out. The WCT playhouse is located at 37 W. Van Lane (behind Shanachie Pub). Once the show gets going on board the roller-coaster everyone’s up for a starring role, even Moises Torres as a human hunk, and the maid played by Mary Burns–with a little guiding help from the legends Gretchen Anderson and Kathy deBane. It’s a rocky affair before the two acting greats get over their feud and find a way to get along. Sometimes it takes an officer of the law, played by Anthony Sylstra, to help two hot talents cool off their tempers. Note: All Thursday, Friday and Saturday Evening Perfomances in 2019 will begin at 7:30 pm. Sunday Matinees at 2 pm. stumble into maturity, self-discovery and glorious moments of grace. ode to youth, life, love, and the strange beauty of human connectedness. (to be produced at Willits High School; we’ll encourage students to participate). oaths and decide to pursue them. Sparks fly, and humor and poetry abound. Tickets for all Performances at WCT (other than First Thursdays) will be available for purchase online through Brown Paper Tickets. by phone any time 1-800-838-3006. Also at the door if not sold out. Advance tickets online, by 800# phone and at Mazahar close 2 hours before the show opens, so get your seats early or show up at the door to claim any unsold seats. This series is all Reserved Seating. If you wish to have Accessible Seating in “Row A” ~ no stairs ~ please make sure to select Row A seats when making your purchase.